Mexico City – Violent crime has become a problem of national security in Mexico, where half of the territory is outside of state control and “we’re in the hands of the narcos,” an intelligence expert and author of a new book on Mexico’s public safety woes, said. 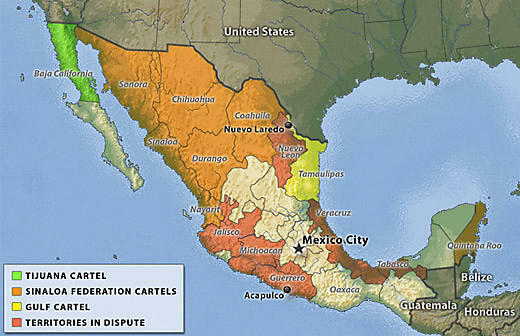 Jorge Carrillo Olea, founder of Mexico’s leading intelligence center, said the“state has lost territorial control, and therefore governability,” over roughly 50 percent of the country. Carrillo, who in 1989 founded the Center for Research and National Security, or Cisen, a civil entity overseen by the interior ministry, said Mexico’s crime and public safety problems will last for decades because the society has “reached a point of no return.” He said the country has neglected to combat money laundering and weapons trafficking to avoid stepping on the toes of big Mexican and foreign capitalists, particularly from the United States. Cartels have weapons to combat Mexican security forces, although “with enormous losses for (the gangs)” because they recruit young men without military training, “give them an AK-47 and they use it as if they were watering a garden,” Carrillo said. The expert said that although the army keeps killing young men recruited by drug mobs, these groups will continue to find more impoverished persons willing to earn between 8,000 and 12,000 pesos ($650-$970) a month and gain a sense of power, obtain women and defy authority. “If policies are measured by their results, there haven’t been any positive results so far. Even though the authorities say they’ve decapitated the (criminal) organizations, these have multiplied and extended (their reach),” Carrillo, who also once served as governor of the central state of Morelos, said. Only the formal structures have changed and President Felipe Calderon’s 2006-2012 administration will conclude with some 50,000 drug-related deaths, according to the expert, who worked closely with the previous administrations of Luis Echeverria, 1970-1976; Jose Lopez Portillo, 1976-1982; Miguel de la Madrid, 1982-1988; and Carlos Salinas, 1988-1994. More than 40,000 deaths attributed mainly to turf battles among the cartels and clashes between gangsters and the security forces already have occurred since Calderon took office in late 2006. While the president’s militarization of the drug war has led to high-profile arrests and slayings of drug lords, it also has coincided with a sharp increase in drug-related violence. The growth of the cartels also has sparked a rise in the number of small-time criminal outfits who commit robberies, kidnappings and, especially acts of extortion, against law-abiding citizens, Carrillo said. Referring to Cisen, the expert said that its original mission was to create a national security system to safeguard the Mexican state but that in recent years it has been placed at the service of each successive administration. He added that previous intelligence agencies, such as the Federal Security Directorate, had always acted as espionage mechanisms that defended the administration in power from subversive threats. But “that won’t satisfy people,” the expert predicted. He therefore called for a grand national alliance that promotes long-term solutions, which he said must be in the hands of institutions, not individual.